The call center is the backbone of a well-managed service industry. By operating a medical call center, you can keep your healthcare clients, patients, and other business interests closer. But what if you have a tight budget and lack of time? Fret not! 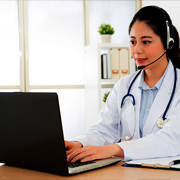 By working with medical call center services provider like O2I your needs are always covered. Be it inbound or outbound requirements we have just what you need. Outsource2india know it best to help you navigate through challenges in customer care services. We offer voice logging solution, IVR, automatic call distribution, call center reporting tools, and other omnichannel support. Our medical answering services will let you create personalized interactions for every client leading to streamlined business growth. Also, you can get access to high-quality reports on KPIs. You can stay in touch with physicians who orders a test on patients. Get detailed information on participating physicians such as office location, practice hours, specialties, credentials, insurance plans, etc. Why Choose Medical Call Center Services from Outsource2india? As businesses evolve it is imperative to keep up with the demand. We understand this better than anybody else. We ensure that your call center functions are scalable in fleeting time without draining your spending. You can quickly scale up your business productivity thanks to KPIs such as average handling time (AHT), first call resolution (FCR), abandoned call rate (ACR), and more. I wanted to inform you of what a great job O2I is doing for our firm. Vinoth Kumar and his team have done amazing work and are extremely reliable. We consider O2I a part of our strategic plans moving forward. Initially, we needed to get a feel of your services and expertise to move forward on other enterprise accounts, and now we have the confidence in doing so. Thank you to you for all the help over the year! When you think of outsourcing medical call center services, think Outsource2india because we are an ISO certified company and a true leader in healthcare BPO. We offer an array of call center services which include medical call center services to take care of the typical customer service aspects of a healthcare provider. If you need call center services that are rightly priced and well equipped to handle challenges in the customer-facing business, look no further than us. We also provide other similar services such as healthcare consulting services, pharmaceutical outsourcing, clinical services and more. Reach us now if you require medical call center services because we have what it takes to multiply your ROI in short TAT.